As dumpster fires abound in 2017, Pepsi has seen fit to add to its roster of flavors with a winter-ish take on its classic cola. 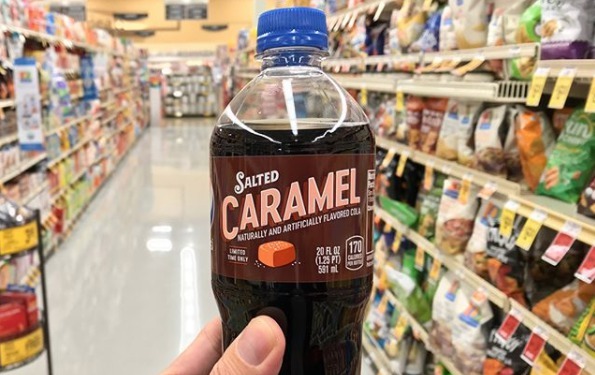 The new flavor is Salted Caramel Pepsi, and we have some questions. Maybe Pepsi is going through a mid-life crisis? Or maybe they’re trying to distance themselves from Kendall Jenner’s controversial Pepsi ad as much as possible? After all, this isn’t the first time the soda has opted for big flavors. Earlier this year they released Pepsi Fire, a cinnamon-flavored soda. Now they’re trying their luck with Salted Caramel Pepsi, but we’re not sure what to think. TBH, Salted Caramel Pepsi sounds a little disgusting and pretty extra. We love the salted caramel flavor as much as the next basic person, but literally no one has ever wanted to mix it with their soda. Here’s how we imagine the pitch meeting went: “Ok guys. Salted Caramel, but make it Pepsi.” We live in a world where snack brands are truly grasping at straws to improve upon classic flavors. That’s why we’ve been unnecessarily gifted with products like Lay’s Everything Bagel With Cream Cheese potato chips. Luckily for us, Salted Caramel Pepsi allegedly doesn’t actually taste either salted or caramel-y. Tasters from The Today Show tried it out and seemed mostly underwhelmed. But they also said it wasn’t “offensive” and basically tasted like normal Pepsi. Hmmmmm. If that’s the case, then the new flavor is purely a marketing gambit. Which doesn’t sound so delicious. Here’s what Today testers had to say about Salted Caramel Pepsi. "When I first learned that Pepsi Salted Caramel was a thing, my initial reaction was, 'Yuck,'" said Today's lifestyle news editor Shane Lou. "[But] Pepsi Salted Caramel isn’t yucky. On the contrary, it’s not bad at all. The caramel flavor isn’t strong, but it’s apparent enough that it’ll give you a sweet aftertaste. If Pepsi is your cola of choice, it’s worth giving the salted caramel flavor a shot." Of course, the internet has some thoughts too. Most of them are negative. Salted caramel Pepsi? At what point do we just say that's enough, tear down civilisation, and start again? But some of them are positive! Except for this review. This review is not good. We appreciate this person’s optimism. I must find a bottle of Salted Caramel Pepsi. I don't know what to expect from it, but I can think of no greater adventure. Guess we’ll just have to try Salted Caramel Pepsi for ourselves. But also maybe not.